On the evening of Tuesday, July 10th, crews from Augusta Volunteer Fire Dept. were dispatched to a house fire in the 900 block of Terry Road. It was a tough fight as the fire had already entered the attic. Crews extinguished the fire with the help of multiple crews and equipment from the New Melle Fire Protection District, Cottleville Fire Protection District, and Wentzville Fire Protection District. St. Charles County Ambulance District sent two ambulances and a rehab trailer for firefighters since the heat index was well over 100 degrees. The Missouri Division of Fire Safety was investigating and they have the final word on the cause. Preliminary information gathered by fire department personnel may show that the fire possibly started with a problem in electrical wires that ignited the exterior wall. It is possible that the fire then burned up the vinyl siding (which burns easily), through the vinyl soffit, and into the attic. The home was a total loss. 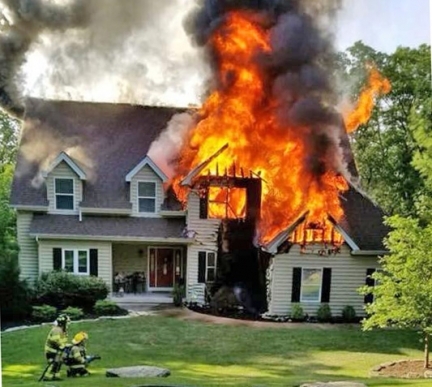 A Go Fund Me page has been set up to help the homeowners with costs not covered by insurance.